February 2015 n Performance & Hotrod Business n 33 The Pro Bracket Radial delivers an affordable, tubeless radial tire that pro- duces consistent, quick elapsed times and reliable performance. When radial tires were first introduced in drag racing, they were fast, but they often proved to be unforgiving at the starting line. We're closing the gap in radial tire tech- nology with the new radial. These tires will run well using more air pressure, providing a stable feel and response at the top end of the track. The tires also deliver low rolling resis- tance, no rollout contrast and zero growth for consistent down-track times. Its best features include … … radial construction, quicker ETs, stabil- ity, air retention and consistency. The biggest misconception performance shops have when serving the Drag Racing market is … … the biggest misconception is that they don't think it's necessary to have drag tires in stock. Racers often have a last-minute need for product, so having inventory in stock and available is key. The outside factor that could poten- tially have the greatest impact on the Drag Racing market this year is … … the economy. If the economy continues to rebound and is strong, so is the racing market. The other is the weather—when the weather is good, people are out there rac- ing and buying product. 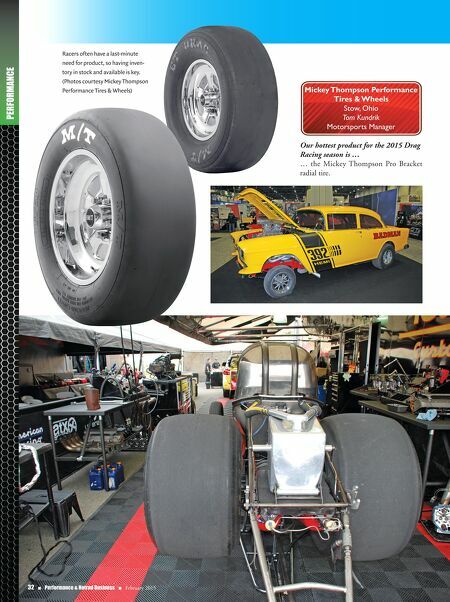 Shops should be excited about serv- ing Drag Racing customers in 2015 because … … there are a lot of great new products being introduced in the coming year including Mickey Thompson's new Pro Bracket Radial tire, and the UHP ET Street SS and ET Street R—all uniquely designed for drag racing applications.